It’s long been accepted by the online community that if you’re shopping for just about anything at all, from books to socks, cat pajamas to car tire pressure gauges, your first stop needs to be Amazon.com. I know I shop there all the time and it’s a rare week where I don’t get something or other, even if it’s just sitting in the “shopping cart” waiting for enough products to make shipping worthwhile. 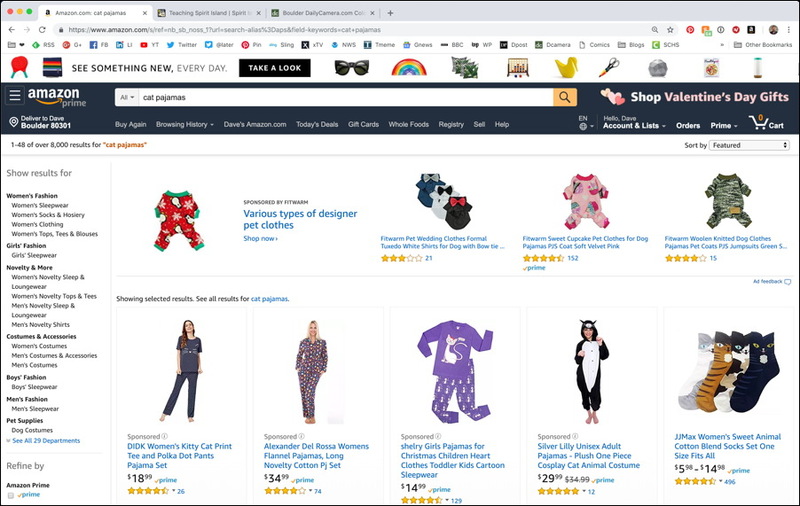 As a consequence, I kind of figure at this point that most everyone knows how to do a product search on Amazon too, but… what you ask is pretty interesting because it’s very doable, so that instead of saying “cat pajamas” as I did earlier, I can actually link to a search for cat pajamas on Amazon! So how did I do that? Let’s go through the steps. The key concept, as with all of these sort of reverse-engineering solutions, is to actually do the search, then look closely at the URL of the resultant search results page. Anyway, do the search and you’ll get a remarkable number of search results on the page, along with lots of sponsored listings too. 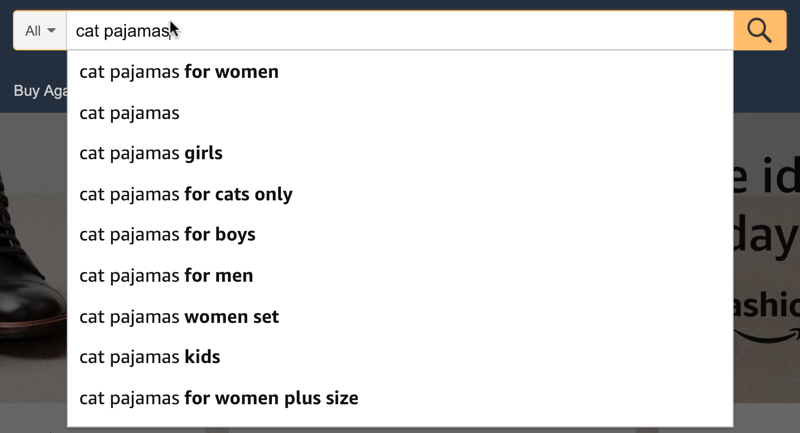 Apparently this is a more popular search than you may initially have realized! I admit, some of this is pretty cryptic (what’s nb_sb_noss_1, for example) but the good news is that you don’t have to understand every element to be able to disassemble and reassemble a search results URL. The critical part is at the end: field-keywords=cat+pajamas. Does it work? Click it and find out! So it’s ugly, but it’s usable. To have the so-called anchor text be something more attractive, you can hand tweak the HTML if you want, or, if i you’re in a tool like WordPress, simply type in the words you want to have shown and clickable, then click on the anchor link tool and paste in the URL. Like this: Buy Boys Soccer Shorts at Amazon.com. That’s it. Now you can just change the field-keywords value (make sure you use “+” instead of spaces between words!) and go wild. You can have dozens – heck, hundreds! – of searches embedded on a Web page now. Good luck. Pro Tip: I’ve been writing about basic HTML and Web coding for a while. Please check out all my HTML help while you’re here! Just starting off on my web development journey and happy to have found your site Mr.Taylor!